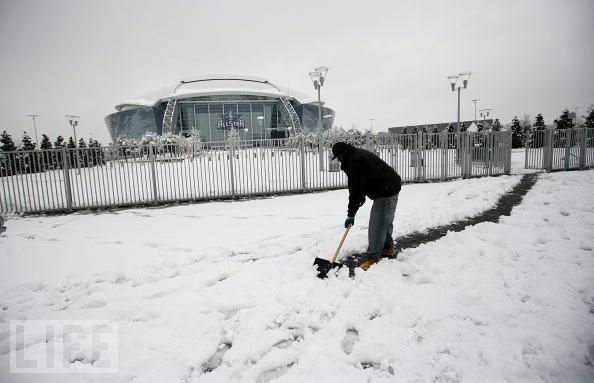 The Dallas-Fort Worth area was hit with some of its worst weather in recent memory as it prepared to host the Super Bowl at Cowboy Stadium (located in Arlington). The weather got so dangerous that ice falling off the roof of the stadium injured six spectators and seriously hurt a cameraman. Game conditions weren’t expected to be a factor as the stadium was planned to have a closed roof for the game, but the frosty temperatures made it difficult for fans to get to Arlington from Fort Worth. The snowstorms cleared up by Sunday morning, but the stadium was hit with another issue. In an attempt to increase the size of the stadium and challenge the Super Bowl attendance record, the Cowboys installed temporary seating into Jerryworld seemingly hanging from the rafters in the nosebleed section. The NFL deemed the seats too dangerous for fans and forced the stadium officials to offer a refund or a re-location of the fans. I can’t imagine anyone would turn down the chance to be at the Super Bowl, but I also can’t imagine they were relocated to an empty seat anywhere in the building. A few hundred fans were forced to enjoy the game on their feet. Ouch. Christina Aguilera had a pretty tough 2010 but had a chance to start off 2011 with a bang by singing the national anthem. I love Christina to death, but her rendition was pretty pitiful. She forgot the lyrics and repeated the second to last line in the first verse to fill the gap, but she doesn’t even have the excuse of being Canadian like Celine Dion when she screwed up. Throw in some dreadful runs and a flat ending and you have one of the worst starts to the Super Bowl in years. In their final game of the season, the NCAA sanctioned USC Trojans defeated the UCLA Bruins 28-14. Led by running back Allen Bradford (28 carries, 212, yards, 1 TD), the Trojan offense amassed a total of 474 yards while UCLA offense mustered a total of 358. After suffering a high ankle sprain against Oregon State, USC quarterback Matt Barkley (15/26 198 yards, 1 TD, 2 INT) made the final start of the season, though far from healthy. The Bruins, ending the season at 4-8, showed some spark early on offense, scoring on a 59 yard TD by running back Jonathan Franklin (13 carries, 109 yards, 1 TD). However, several crucial turnovers, including a fumble that was recovered by the Trojans for a 68 yard touchdown, prevented the Bruins from getting into an early rhythm. UCLA quarterback Richard Brehaut (20/35 230 yards, 1 TD, 1 INT) eclipsed his season high in passing yards but was unable to upend the Trojan defense. 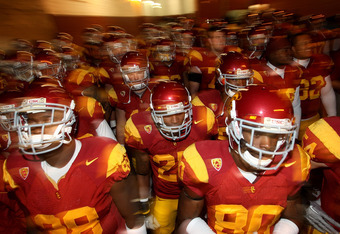 Both USC and UCLA head into the offseason to prepare for the 2011 season. USC is focused on harboring potential in its young players to battle the NCAA sanctions for one more season. UCLA coach Rick Neuheisel commented at the end of the game, “We will do better.” UCLA looks to shake off a disappointing stretch and improve for the 2011 season. After suffering a loss against Auburn, LSU was looking to take on the Crimson Tide of Alabama in hopes of upsetting the much hyped team of the SEC. Capitalizing on two turnovers and converting on crucial plays, LSU did just that. On a 4th and 1 during the 4th quarter and down 14-21, Les Miles opted to go for it. The Tigers ended up running a reverse run play that went for 23 yard which eventually set up a touchdown to tie the game at 21. LSU QB Jordan Jefferson was solid going 10/13 for 141 yards and one touchdown. Meanwhile, Alabama’s high powered offense was held to a total of 325 yards with QB Greg McElroy passing for 223 yards with 2 TD’s and an INT, and RB Mark Ingram rushing for only 97 yards with an average of 4.6 yards per carry. After converting a 3rd down in the last few minutes of the game, LSU was able to run the clock down to secure their victory over Alabama at 24-21. Chances are slim of reigning national championship Alabama clinching the SEC title with two losses. They are looking to take on a very confident Mississippi State team. They hope they can win to keep chances of making the title game alive. 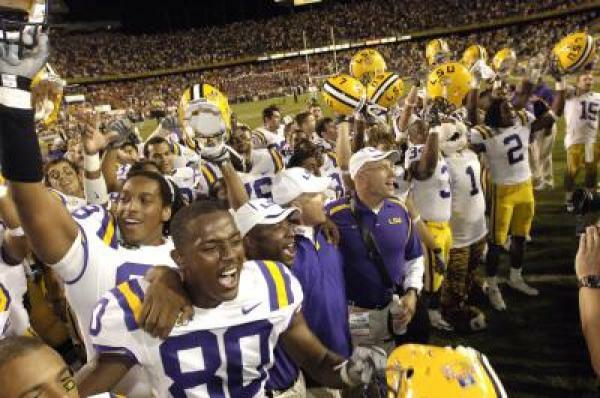 Meanwhile, LSU has grabbed the attention of the nation as a BCS title contender. Now ranked 5th in the BCS poll, the LSU Tigers take on Louisiana-Monroe where they hope to continue their winning streak and strive for a bid in the BCS National Championship game. After demolishing the Trojans in 2009, the Oregon Ducks made their way to the Los Angeles Memorial Coliseum to take on the Trojans in a much hyped Pac-10 matchup. Having last hosting a #1 team in 1988, USC looked to dethrone the top-ranked Ducks. The game was a shootout offensively for both teams. With 11:19 left in the 3rd quarter, USC regained the lead at 32-29 when quarterback Matt Barkley (26/49 for 264 yards, 1 TD, 2 INT) punched it in from one yard out, throwing the stadium into an energized frenzy. However, quarterback Darren Thomas (19/32 for 288 yards, 4 TD’s, 1 INT) and LaMichael James (36 carries for 239 yards, 3 TD’s) bounced back, marching past the struggling USC defense. 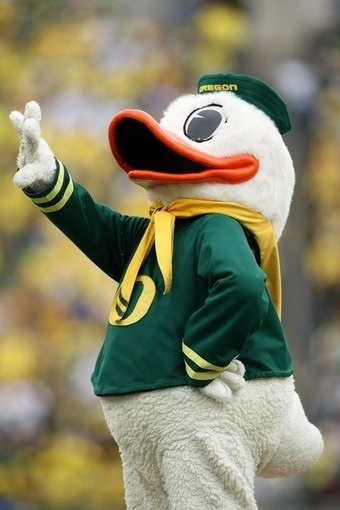 Oregon scored 24 unanswered points to end the game at 53-32. The Trojans return home to face a solid Arizona St. team, where USC hopes to maintain composure after suffering a disappointing loss. Meanwhile, now taking the top spot in the BCS poll, Oregon hopes to maintain its undefeated record, though faces challenges in both 15th ranked Arizona and rival Oregon St. In a matchup between two Pac-10 powerhouses, the 9th ranked Stanford Cardinal made their way into Autzen Stadium to take on the 4th ranked Oregon Ducks. Leading 21-3 after the first quarter, the Cardinal seemed to be en route to a win by dismantling the Ducks’s defense and scoring at will. 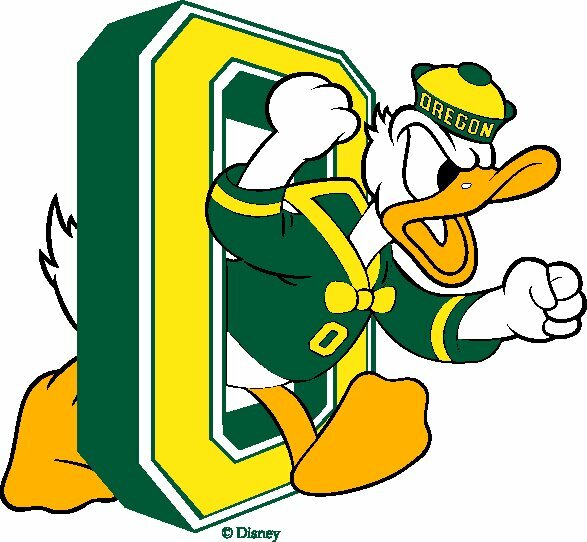 However, Oregon’s offense gained momentum in the 2nd quarter, with quarterback Darron Thomas (20/29 238 yards, 3 TD’s, 2 INT’s) passing for 2 touchdowns and running back LaMichael James, who set single game rushing yard school records with 257 yards and 3 touchdowns, scoring on a five yard scamper. Going into halftime, Stanford led at 31-24. In the second half, Oregon’s defense shut down Stanford offense while Oregon’s offense scored 28 unanswered points. Stanford quarterback Andre Luck (29/46 341 Yards, 2 TD’s, 2 INT’s) had a chance to cut the deficit to seven threatening at Oregon’s own 5 yard line, but after a botched snap and a failure to convert on 4th down, Stanford’s hopes for a comeback were extinguished. Even with a conference loss, Stanford is still ranked in the AP’s top 25, and look to take on the USC Trojans, who suffered a last second upset against Washington, in Palo Alto. Meanwhile, Oregon looks to improve their record to 6-0 when they travel to Pullman to take on Washington State. Already into its sixth week of play, the English Premier League, also known as the Barclays Premier League, has had its ups and downs. With twenty teams and trades involving many high class players, it is unsure how things will eventually turn out. The league’s first place defending champions, Chelsea, had suffered their first loss to Manchester City, with Carlos Tevez’s single strike clinching victory. Arsenal, who currently sits one standing below Chelsea, also had their first loss to West Bromwich Albion 3-2, whose players Peter Odemwingie and Gonzalo Jara scored within two minutes of each other. There were several game draws during the week, most notably the game between Liverpool and Sunderland. What seemed to be a lost cause for Liverpool losing 2-1 turned into a draw when Steven Gerrard saved his team with an equalizer off of a cross from Fernando “El Niño” Torres. Even though it is early in the season, the standings look fair. The four powerhouses maintain their place at the top while the other teams are struggling to make a difference. Chelsea and Arsenal have received their first loss of the season while the famed Manchester United is in third and derby rivals Manchester City in fourth. Stoke City, West Ham United, and Everton have a long way up from the cellar in which they currently reside. As the season gets into its latter phase, things will start to heat up and tensions and passion will rise for fans’ favorite teams to come out on top. The season runs from August to May, playing thirty-eight matches each for the twenty teams. Forty-four clubs have competed in the EPL, but only Arsenal, Chelsea, Liverpool, and Manchester United have managed to win a title. 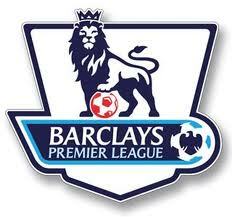 Since its inception, the English Premier League has become the most popular professional league in the world. As we continue to watch the season progress, we will see many great talents, controversies and achievements that have shaped the EPL to what it is now. In one of the biggest matchups of the season, college football fans were not disappointed by the showdown between top ranked Alabama and tenth ranked Arkansas, both considered to be national title contenders. 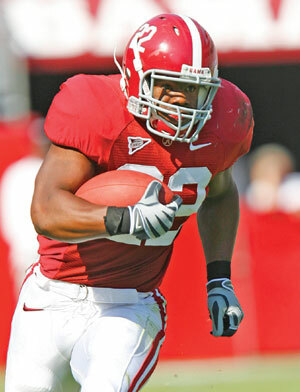 In his second game since a knee injury sidelined him for the opener, Alabama running back Mark Ingram (24 carries for 157 yards, 2 TD’s) was crucial in bringing the Crimson Tide to victory. With 3:18 left in the game, Ingram would score a go-ahead touchdown to make the final score 24-20. Arkansas quarterback Ryan Mallett passed for an impressive 357 yards, but had three interceptions, one of which was thrown with 1:48 left in the game. Though stung by the loss, the Razorbacks look to get on a winning streak as they take on Texas A&M at home in Fayetteville in two weeks. Alabama returns home next week to take on Urban Meyer and the Florida Gators in one of the most anticipated SEC match ups of the season.